The treatment sends bursts of radiofrequency or laser energy through a catheter; the resulting heat intentionally destroys vein wall tissues along the length of the vein. Vein ablation relieves symptoms associated with painful varicose veins, improves the appearance of the legs, and has a low risk of side effects. Varicose veins occur when weak veins near the surface of the leg stretch, bulge, and twist. Varicose veins can be visible through the skin. Varicose vein ablation destroys varicose veins with bursts of radiofrequency or laser energy. Varicose vein ablation causes little to no pain, leaves no scarring, and is as successful as surgery for varicose veins. Wish to improve the appearance of varicose veins. If varicose vein ablation is used cosmetically, it may not be covered by health insurance. First, the physician examines the legs using duplex ultrasound to decide whether varicose vein ablation is appropriate and is likely to improve symptoms. The patient does not need to do any special preparation for the procedure. Healthy patients with varicose veins are eligible for varicose vein ablation. Pregnant women who want to treat varicose veins should wait 6 weeks after giving birth before scheduling therapy, because pregnancy-induced varicose veins may fade. Having thin or muscular legs or veins close to the surface of the skin may increase the risk for minor burns from the procedure. 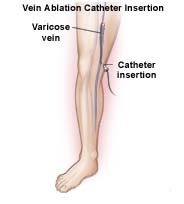 Varicose vein ablation is performed as an outpatient procedure under local anesthesia. Immediately before the procedure, the physician will perform duplex ultrasound to map the leg veins. Next, the physician will mark the varicose vein on the skin. Although the techniques for radiofrequency ablation and laser ablation vary slightly, both treatments destroy tissues with heat. Radiofrequency energy comes from electric and magnetic energy and laser energy comes from light. The physician passes a catheter (long, thin tube) through a small nick in the skin above the vein and moves the catheter to the end of the vein. The physician activates a radiofrequency generator or sends laser pulses through the catheter as he or she slowly retracts it. The heat destroys the tissue along the length of the vein. The vein collapses and is eventually reabsorbed by the body. Occasionally, the patient may experience brief pain if the radiofrequency catheter or laser heats tissue near a nerve. This pain disappears once the physician moves the catheter. Patients can resume normal activities immediately after the procedure but should avoid strenuous activities such as lifting more than 10 pounds for 1 to 2 weeks. Thigh-high prescription compression stockings are applied immediately after the procedure. The patient wears the stockings for 1 week. Minor bruising, burns, or soreness may occur after vein ablation. Few serious complications have been reported. In theory, any procedure that destroys vein tissue can trigger deep vein thrombosis (DVT) in patients who are susceptible. However, no cases of DVT following vein ablation have been reported to date. Less than 10 percent of varicose veins treated with vein ablation return after 2 years. Elevate the legs or walk around frequently during the day.